"Place all your eggs in a basket....and watch the basket." As a sidebar posting, (while I am writing my three-part series about honey) if you do not mind, I decided to give you some simple information about eggs. As I am testing and creating my breakfast recipe offerings for 1922 Starkey House Bed & Breakfast, I have been reading through some great websites for information. Please use the comments section at the end of this post to let me know how you like your eggs. Do you like them as an omelet? Fried sunny side up or over easy? Soft scrambled? What are some other types of breakfast/brunch foods do you like that contain eggs, such as Quiche? Since eggs are a popular breakfast food I thought I would share a few simple things about eggs. I will use the freshest eggs that I can find for my eggs dishes and for baking. I am near a lot of local farmers that have free-range chickens for eggs and meat. Truth is, they produce a lot of eggs and sometimes have an overabundance on the shelf. I've noticed that many commercial egg producers are date stamping each egg now. Great idea! So if I want to buy eggs from within my farming community I will request eggs that are only up to a few days old. But I found that there are a couple of simple and quick tests that I could do to really be sure about freshness. If you look at the picture example of two cracked eggs, the whites on the egg to the right, surrounding the yolk are holding tighter to the yolk. This is the fresher egg. Whereas the egg on the left has whites that are spread out. This egg is probably at least a few weeks old and still edible but if you want absolutely the freshest eggs, you should choose those that have plump yolks with the white albumin closely surrounding the yolk. Another easy way to check for freshness is to place it in a glass of water. A fresh egg will sink to the bottom, a slightly older egg will stand upright, and an old egg will float. According to a few state agricultural sites eggs can last refrigerated for quite a good long time, up to three weeks. So I don't want to mislead you by saying you should throw yours away if you have had them properly refrigerated. Again, eggs that are date-stamped will help you decide. As for me though, when I am cooking or baking with eggs for my guests and 1922 Starkey House Bed & Breakfast I would rather be safe. Also, freshness always yields better flavor. Not all eggs are white, as you can see above. Some are various shades of brown or even blue. That all depends on which breed or variety of chicken they are from. The color can also depend on whether the hen is classified as a heavy-weight or not. 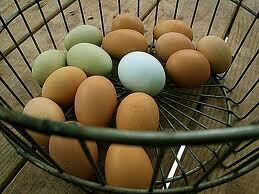 The most commonly used eggs are white or brown. 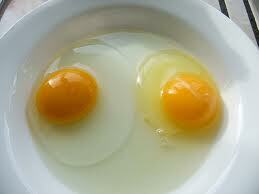 The yolks are also various shades of yellow ranging from a very dark orange to a lighter yellow. Yolk color depends on the breed of the hen but also on her diet. Some farmers use marigold flowers in their feed that are healthy for their flock but also contribute to a deeper orange yolk color. As is true with other food providing animals, some chickens are bred specifically to be egg layers and some for their delicious meat. Some are good for both. Beat eggs and pour in small greased pan on medium heat. Add cheeses covering one side, then fold over and turn off heat. Let sit in pan 2 more min. then serve. Serves 1-3 depending on appetite. I like the idea of using Turkey bacon. One thing I love about omelets is that just like pizza, there are 99 variations. This one sounds good!